A Visit to the Pastor’s Study is intentionally about the Church – not about a little media empire. The programs highlight church mission, missionaries, and missionary principles. They tackle issues like the transgender revolution, discernment in watching movies and television, and the formation of young Christian disciples in a secular world. They introduce people to topics like confessional standards and their value, biblical counseling, and living wisely in our technological age. And everything from the opening monologue through the interview with guests, to responses to callers comes from a distinctively Reformed perspective. Listeners are directed to Reformed churches. And they are regularly reminded that everyone needs a pastor. In an age with so much competition for people’s ears, “Ted Talks” claim an audience because they are full of substantial content, they deal with relevant topics, and they are presented with excellence. Those are the same standards for A Visit to the Pastor’s Study. Each program offers fascinating insights into some aspect of church life or ministry. Guests are either well-known authorities in their field, or people who should be known for their commitment to Reformed Christianity in their spheres of service. There are “no little people” on A Visit to the Pastor’s Study (in the same way that there are “no little people” in church life). And, as with “Ted Talks”, their stories are designed to really help the listener. A Visit to the Pastor’s Study, God willing, is just the flagship project for greater use of media by Orthodox Presbyterian congregations and other NAPARC churches. Our goal is to make the program available to local churches for use on Christian radio stations whose signals reach their area. (The 55-minute time frame allows churches to promote their services, location, and contact information before and after the program.). From there, we want to encourage churches to purchase licenses for Low Power FM stations (LPFMs) that will broadcast distinctively Reformed programming in the area surrounding a local church. We have the 24 hour a day programming already available through Redeemer Broadcasting, Inc. – a network explicitly committed to the Reformed confessions and to the church. What a means of local church outreach! For Now: Listen! Call! Invite! I want each of you to benefit from (and to enjoy!) 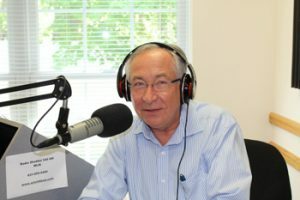 this unique media presence for the Orthodox Presbyterian Church (and other NAPARC churches.) Listen to the program Saturdays from noon – 12:55 (Eastern time) on the live stream from Redeemer Broadcasting. I invite you to call in and be part of the weekly program. The live call-in number is (631) 955-5400. Learn more about the entire project at visitthepastorsstudy.org, and “Like us” on Facebook. Invite others to receive Orthodox Presbyterian ministry that supplements the ministry of a local church. And pray that the Lord will use this as just the beginning of media projects that bring faithful, Reformed, Church-focused pastoral ministry to those who may never have stepped into an Orthodox Presbyterian Church. Remember: Everyone needs a pastor! Rev. Bill Shishko is the Regional Home Missionary for the Presbytery of Connecticut and Southern New York and host of A Visit to the Pastor’s Study.